Have you ever been in this situation at your home in Nashville before: You’ve just finished baking something delicious in your oven, it’s right at the point where if you bake it any longer it will burn, but, horror of horrors, you don’t have anywhere to put it down without burning your kitchen countertop. This is a situation that I found myself in just last week at my girlfriend’s apartment with her laminate kitchen countertops. There I was, with my fingers feeling way too warm, as I searched for a wood cutting board to place the hot baking dish on. It’s no secret why granite countertops are popular amongst frequent bakers: they never have to worry about where to put a dish down as granite is incredibly heat resistant. The entire point of your kitchen is to make things hot so that they’re edible for your family – why shouldn’t your kitchen countertop be able to stand the heat? How does that saying go about not standing heat and getting out of the kitchen? Why is a granite countertop so heat resistant? Granite is a natural material which has an upper hand when it comes to heat as it is formed in the pressure and heat of volcanic activity. When you think about where it comes from there is no questioning why it is the best material for your kitchen countertop. A hot pan full of cupcakes is nothing next to liquid hot magma! A second aspect of how it handles heat is that it doesn’t absorb heat readily through conduction. Another material that people use for heat resistance is stainless steel, the problem with a stainless steel kitchen countertop is that it will quickly heat up and burn you if you put your hand on it soon after removing the hot pan. 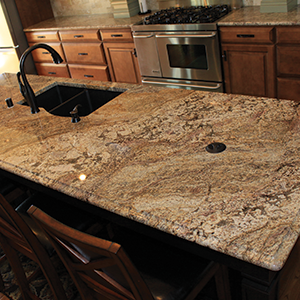 The team here at Stone World are ready to help you choose the correct granite slab for your kitchen countertop. Contact us now, or take a look through our kitchen gallery, for design tips and ideas. We’ve helped many homeowners in Nashville, Tennessee find the high heat resistant granite countertop that meets their needs as bakers, as well as matching their design goals.